Description: BOOK REVIEW by Lonnell E. Johnson, Ph.D., Professor Emeritus, Otterbein College. In the Beginning. . . The Art of Bob Spence. Three unforgettable words open the Book of Genesis: �In the beginning�� The same three words make up the title of a collection of artwork by Bob Spence. This display of talent is no ordinary collection, however. The newly released �coffee table book� not only showcases twenty Christian abstract designs but also offers accompanying Scripture verses and artist commentaries. Described as �colorful, vibrant, and inspirational,� the varied geometric formations reflect a free-floating style that evokes a feeling of motion. The accompanying commentaries are illustrative, insightful, and thought-provoking in helping the reader interpret and apply the themes of the designs in life application. Because of the written component the book is an excellent resource for individual Bible study and/or small group discussions. In addition to the designs and other spiritual writings, Bob relates autobiographical elements of growing up in Clyde, Ohio, mentioning the influence of his parents and grandparents, all of which adds to the uniqueness of the book. Exactly who is Bob Spence and what makes his artwork so special? For as long as he can remember Bob has been a doodler. The 62-year old former teacher, school administrator, insurance professional, and business consultant �doodled� designs during telephone conversations and meetings, not to mention classrooms during his school years. He would doodle on 3x5 cards using colored markers and absent-mindedly stacked the cards on the corner of his desk. Then in 2007 his wife, at the urging of a friend and neighbor framed a set of the card designs and displayed it. When people saw the framed set, they wanted to buy their own set. As word spread about Bob�s doodles, people expressed an interest in seeing the designs in larger formats than 3x5 cards. 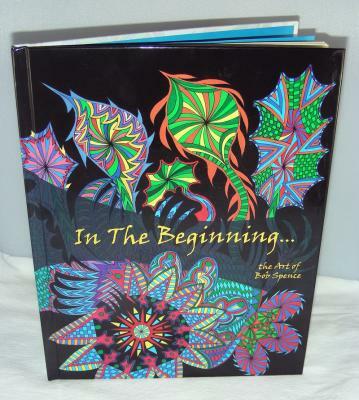 With the support and encouragement of many friends, Bob began �doodling� in larger formats with the 8x10 inch size becoming the most popular. With increasing interest in his works, Bob took his doodling to an art form. He formed two brands, Bob's Doodles and Spence Expressions, and then a company, Adonai Art Designs, LLC, to market and sell his �doodles,� now under the category, abstract art. It is interesting to note that all of Bob's designs are done free hand. He sits down with markers and paper and then does the designs without the aid of straight edges or other devices. A friend calls his designs, "expressions from his heart." When Bob sits down with markers and paper, he says that he has no idea what he is going to design. He comments, �My designs are spirit inspired and spirit driven. I am God�s vehicle to express these feelings in art.� When asked what he would like for his readers to take from his book, he responded, �What I want the readers to experience is the Word of God. I want them to think about how God works in them and how they can respond to him.� �In the Beginning�� flows from the heart of a man moved by the Spirit of God. The works of his hands are custom designed to touch the hearts of those who partake of the art of Bob Spence.